There are many cats that inhabit my house. None of them are mine. This one is Dee. 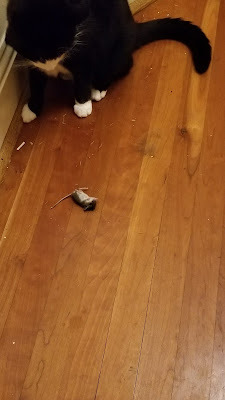 She's a black and white Domestic Shorthaired cat and she has caught a mouse. It's still alive. If this was a video you'd see the mouse panting with fear. I caught this mouse and released it back outside. An hour or so later I was driving down my street returning from a shopping errand when I saw her again. This time she's got something much bigger. She's nabbed a squirrel. Turns out that this is not Dee but rather her neighbourhood doppleganger. We've taken to calling this cat "Double Dee". There you go Dee. That's how you hunt! 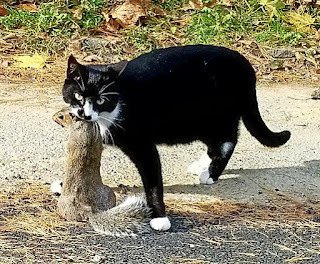 Next time bring something home that we can all eat.